Keeping active in Australia is made pretty easy with the number of walks, attractions and adventures that there are lined up and waiting for you. My first couple of weeks in Australia this year, just after the New Year had begun, were pretty active and included some pretty beautiful walks that I’d love to share with you. The great thing about walking is that you cover distance, you work out and it’s usually a pretty low cost day out, if not free. The walks I’m about to share are all low-budget (food and transport cost only) adventures. They’re perfect for the active traveller, the budget traveller and the keen explorer… I got you! First up is a walk that would be perfectly started with brunch in The Rocks – the gorgeous area of cafes and restaurants that sits just under the bridge (Opera House side). You then ascend the stairs until you are on the level for the footbridge and away you go. It’s about a 20-minute walk across, with views over the central business district (CBD) and the Opera House. The bridge size and height is quite overwhelming, but it’s totally safe and has structures all around the footpath for your safety. Once you’ve crossed the bridge you can hop down to Luna Park and fill yourself up with adrenaline and candy floss before either walking back across the bridge or catching the ferry. A day trip you cannot miss if you have any spare time in Sydney. Jump on the train for $12 (return!) and watch the landscapes transform into the greens of the National Park. Choose a trail, take a packed lunch and head out to explore some of the most exhilarating views and climbs in New South Wales. See my guide to planning a Blue Mountains adventure here. An absolute must when you come to Sydney and a popular route with both tourists and locals. It’s certainly not a hidden gem but there’s room for everyone and you’ll most likely be joined by runners as you go. This 6km route hugs the edge of the coastline dropping in and out of a selection of clear blue water bays like Tamarama beach, Bronte beach and Clovelly beach. Top tip: take your swimwear – if it’s a hot day you’ll be more than tempted to go in! Top tip: take a reuseable water bottle; there are water fountains that you can fill up with along the way. There’s no better way round to do this walk. You can start from either Coogee or Bondi. A walk followed by a beach day is the perfect combination. Top tip: to work out your best way to get to the start, download Citymapper. Citymapper is the best way to work out the most efficient route for you to take taking into consideration public transport, walking, cycling and Uber. If you’re looking out towards the ocean, the path starts on the left – you won’t miss it. If you do get lost, ask anyone and they’ll point you in the right direction. The start of the route is on the right hand side of the beach if you’re looking out toward the ocean. You pass the famous Bondi Icebergs Club before climbing up onto the rocks. Top tip: Take your cameras! The views are breath taking. This 10km walk is one of the most popular to do in the area, passing through Sydney Harbour National Park and many bushland reserves and local streets. 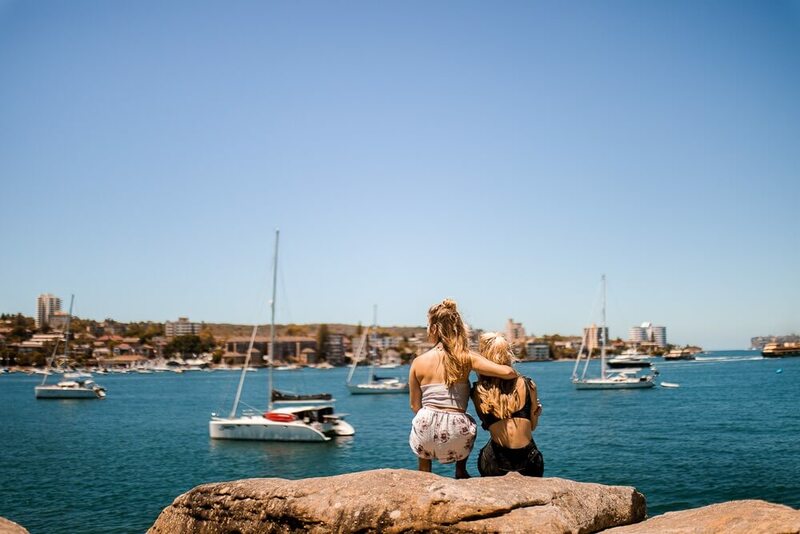 Along the way you can discover the beauty of landmarks such as Crater Cove, Manly Cove and Reef Beach. You can get buses 178 and 180 from Wynyard Station to The Spit, and the 30 minute ferry back from Manly. Also bear in mind that The Spit Bridge opens a few times in the day to allow boats in and out of the harbour, so either check the times online or be prepared for a little wait! See my complete guide to Manly here. Whether you watch Home & Away or not, Palm beach is an insanely beautiful day trip from Sydney. Take the 199 bus from Manly Wharf and ride around 60 minutes on one bus from the centre of Manly all the way up to Palm Beach. Top tip: Top up your opal card or have cash for the driver – you can’t pay with card! At Palm Beach you can enjoy brunch on the beach front, have a beach day with a picnic, walk up to the lighthouse or go surfing. If you have time, stop off on the bus at Newport and get a sunset drink. Seeing Sydney by foot is possibly the best way to see it. There’s just so much to see and though I’ve been four times now, I’m sure there is still plenty I’m yet to discover. Obviously you have the harbour bridge and opera house but if you have time, dig further into the neighbourhoods and suburbs. – Walking along the waterfront from Wooloomooloo around past Mrs Macquaries chair and through the botanical gardens. – Taking a walk from the ferry port, down by the harbour and through the rocks (underneath the bridge). – Getting some famous custard fingers in China Town and walk over to Darling Harbour. – Heading down to Parsley Bay (jump off the bridge if you’re seeking adrenalin and the tide is high) before walking along to Watsons Bay and toasting the evening over fresh fish and cocktails at Watsons Hotel. – Meandering through Surry Hills and grab brunch at one of the many gorgeous spots there. Ah, writing this post is seriously making me want to go back. I’ve created so many guides for Sydney and Australia, click here to head to the Australian part of my blog where you can browse them all! A Melbourne To Sydney Roadtrip – The Places You Cannot Miss! What were your favourite walks? I’d love to know!